Neighborhood comes to terms with Episcopal School zoning changes - The Resident Community News Group, Inc. | The Resident Community News Group, Inc. The Atlantic Boulevard entrance to the Episcopal School of Jacksonville (ESJ) will soon sport a new information kiosk, signage and entryway landscaped areas, two off-duty officers from the Jacksonville Sheriff’s Office to direct traffic, and a new residential road entering the adjacent Live Oak Manor neighborhood, thanks to zoning legislation passed unanimously by the Jacksonville City Council March 12. After a year of contentious discussion between the school representatives and residents from the adjacent subdivision, Live Oak Manor Neighborhood Association, who worried a kiosk in the intersection of Munnerlyn and St. Elmo Drives might back up traffic sufficiently to hurt the property value of their homes, City Council members rubberstamped an amended version of Zoning Ordinance 2018-759, which had been unanimously passed by the Council’s Land Use and Zoning (LUZ) Committee March 5. The amended ordinance rezoned the school’s 43.5-acre campus from PUD to PUD with several conditions. Map outlining new zoning of the Episcopal School property and the adjacent neighborhoods. The rezoning ordinance modifies aspects of the Episcopal School’s Planned Unit Development (PUD), located at 4455-4521 Atlantic Blvd., allowing changes to the school’s main entrance. The plan calls for a new manned entry pavilion for increased campus security, a realignment of St. Elmo Drive to allow for better traffic circulation and entry space near the pavilion, enhanced main campus signage with matching architectural directional and traffic control signage, and a beautification effort through new entryway landscaping. In operation for more than 50 years, ESJ offers private education for grades 6-12. Much of its property has been owned by The Episcopal Church since the 1900s. Prior to this rezoning, the school’s PUD was modified in 1997 when the campus was converted from PBF-2 and RLD-G to a PUD in order to unify it under one zoning designation. This also allowed ESJ to tie its educational facilities with converted residential buildings on the west side of St. Elmo Drive so that there could be better traffic circulation with the middle school drop-off area at the end of St. Elmo Drive as well as additional parking underneath the Hart Bridge, according to documentation filed by the school with the City Planning Department. 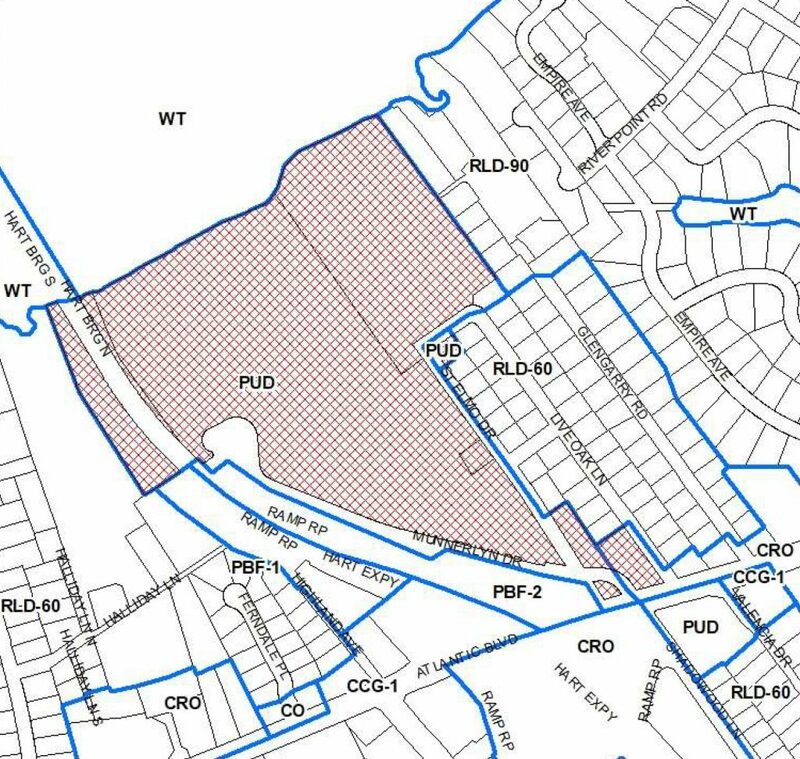 When initially proposed, the current PUD zoning plan was very controversial among residents of the Live Oak Manor subdivision, adjacent to the school, which consists of 33 homes on the east side of St. Elmo Drive, Theo Street and Live Oak Lane. The small subdivision shares an entrance with the school on St. Elmo Drive and has a second entrance from Atlantic Boulevard onto Live Oak Lane. Worried the installation of a “manned entry pavilion” might make traffic worse on their residential streets and lower property values, the homeowners at first pitched a “David vs. Goliath” type battle against the school’s plans. After more than a year of negotiating with the school, a schism erupted between St. Elmo Drive and Live Oak Lane residents within the homeowners’ association about the best path middle school traffic should take as it makes its way to the drop-off/pick-up point at the top of St. Elmo Drive. Map showing the location of the new guard shack and residential road at the Atlantic Boulevard entrance of Episcopal School of Jacksonville, which the school will build as part of its $17 million capital improvement plan. From the start, the school had been solidly against the neighborhood’s suggestion that middle school traffic from Atlantic Boulevard travel down Munnerlyn Road, a private road owned by ESJ, to Highland Avenue and back onto Atlantic Boulevard. Instead, the school’s preference was to keep things as they were with parental traffic pouring through Live Oak Manor’s residential roads during peak drop-off and pick-up times. 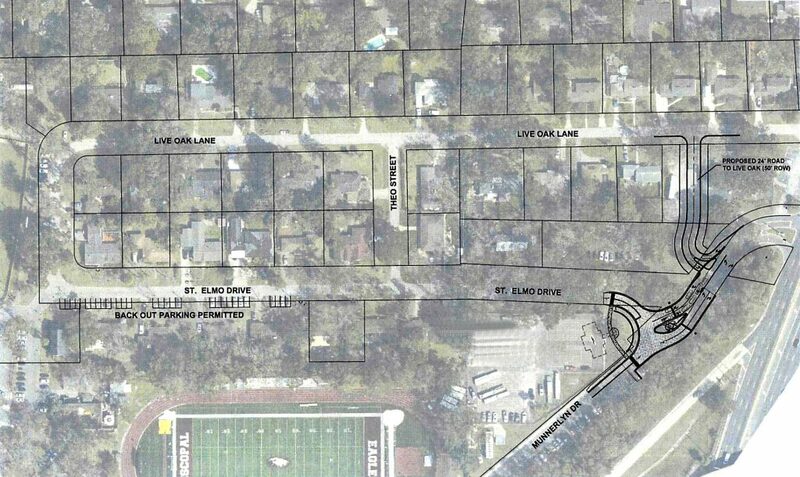 In a private meeting between school officials and the homeowners’ association prior to LUZ’s meeting March 5, an agreement was reached comprised of 13 conditions with the main outcome being that the entire traffic burden would shift onto St. Elmo’s Drive. Listed among the conditions were having the school employ two off-duty JSO officers to prevent parents from driving on Theo Street and Live Oak Drive; installing a sidewalk and speed tables on St. Elmo Drive; placing “No Parking” signs in front of the St. Elmo residences; and having a new cut-through road built by the school near the entrance pavilion between St. Elmo Drive and Live Oak Lane. Eighty-two percent of the homeowner’s association (mainly Live Oak residents) voted in favor of the plan –with five St. Elmo homeowners against and five residences unresponsive, said Live Oak Manor Neighborhood Association President Sean Bowman during the LUZ meeting March 5.
hood Association founder Jimmy Holderfield. Holderfield had been serving as president of the neighborhood association until early February when the neighborhood association voted to replace him with Bowman during a meeting he did not attend because he was on vacation. The residents believed Bowman would do a better job finding a peaceful resolution with the school, explained Don DuPree, a Live Oak Lane resident. Seeming to sympathize with the St. Elmo homeowners during the March 5 meeting, LUZ Committee member Danny Becton (District 11) moved to strike two of the conditions, eliminating the No Parking condition and any official language restricting middle school traffic from Live Oak Lane and Theo Street. After some discussion the LUZ board voted 7-0 to adopt the ordinance with the amended conditions. prior to the first final inspection within any phase of development, the owner or their agent shall submit to the Planning and Development Department for its review and approval either an affidavit documenting all conditions to the development order have been satisfied or that a detailed agreement for the completion of all conditions to the development order. Representing ESJ at the March 5 LUZ meeting, Attorney Steve Diebenow of Driver, McAfee, Hawthorne & Diebenow, said the school would be happy whether LUZ approved its plan with only those two conditions or with the 13 conditions, which it had agreed upon to appease the neighborhood residents. All conditions were to be implemented at the expense of the school. Not more than two monument signs would be placed along Atlantic Boulevard and one monument sign along Highland Avenue at the entrance to the school shall be permitted of up to a maximum of 100 square feet in area and six feet in height, each. At least one meeting annually, prior to the beginning of the school year, shall be hosted by ESJ with the neighborhood residents to discuss upcoming events, new construction, or changes to the school operation and to address any ongoing concerns by either party. Additional meetings will be held at the request of the neighborhood association or ESJ may be scheduled and held at a mutually agreeable time at the request of either party. It was also a condition that the information kiosk be designed so primary vehicle access shall be from Munnerlyn Drive and a right-only exit shall be permitted onto St. Elmo Drive. The city will issue no permits to ESJ to build the information kiosk until it builds the two-way public road to City standards on school property that extends from St. Elmo Drive to Live Oak Lane south of the proposed entry pavilion. Typical monument signage identifying the Live Oak Manor neighborhood would also be installed at the corner of St. Elmo Drive and the new two-way public road. The design, location, and orientation shape will be approved by the City and the Live Oak Manor Neighborhood Association. Another condition is to have ESJ hire at least two off-duty Jacksonville Sheriff’s Office officers to direct traffic during morning drop-off, afternoon pick-up and during special events. This condition is to remain in place unless the middle school drop-off/pick-up site is permanently moved to Munnerlyn Drive. Detailed instructions to clarify their scope of duty would be routinely issued to any private security guards employed by ESJ, and that ESJ would supply a copy of the security guard instructions and any subsequent updates via email to the secretary of the Live Oak Manor Neighborhood Association. Approval is also being sought to prohibit right turns on red from Atlantic Boulevard onto St. Elmo Drive and to install “no-right-turn-on-red” signage for the traffic light at the intersection of Atlantic Boulevard and St. Elmo Drive. “This condition shall be considered satisfied at such time as ESJ requests the signage and no cause of action for enforcement of this condition shall arise should approval not be granted,” states the ordinance. After the meeting, Bowman said he believes the conditions will enable ESJ and the residents to “trust” each other again.